I had to post again. Sorry. Whole wheat pita (pitae?) 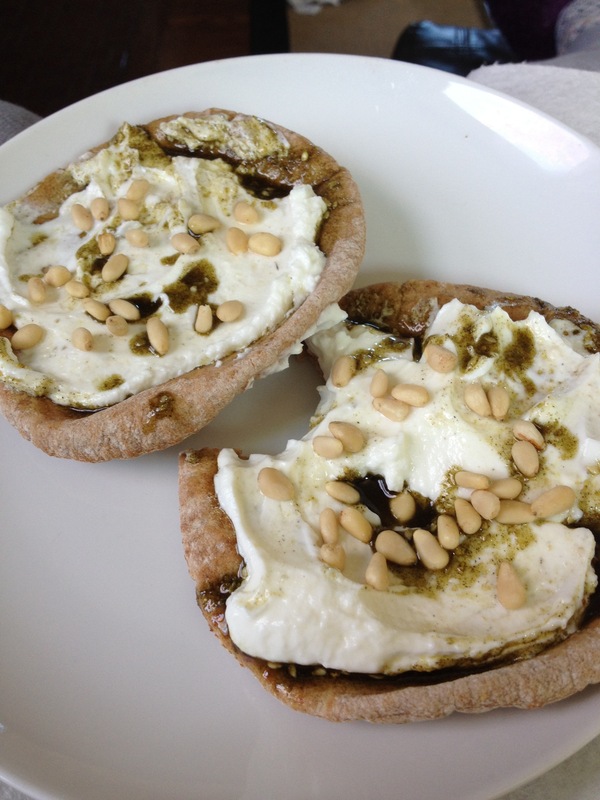 lightly toasted, drizzled with za’atar, lemon juice, and olive oil, topped with non fat greek yogurt, and sprinkled with pine nuts. It. Is. Delicious. What is this stuff, and where do I find it? Za’atar is a blend of arabic spices, including sumac and sesame (and a thousand other things). I usually add salt and a bit of fresh lemon, and sometimes garlic powder. Its flavors come out best with a fat–olive oil usually– and it makes it go a long way. I find that it is more palatable this way, rather than sprinkled onto things dry. I bought my very small container at Whole Foods, but you can find it arabic markets or on Amazon.